Whether you are a seamstress making clothing garments for customers, an alteration lady or a craft person, there is a regular need for some type of pattern paper. In pattern making, it is mandatory that some type of pattern paper is used to make the patterns. We sometimes tell people to check out their local newspaper office for “end rolls” of newsprint paper. These end rolls sometimes have several yards left and they are very wide. Grocery bags can also be used for making changes to patterns and for pattern making; however they would probably have to be cut apart and taped together for the bigger items. The most practical type of pattern paper would be the type that could be re-used without tearing and can be pinned to fabric without tearing, etc. There is only one type of pattern paper that we recommend — which is non tearable and is washable and dryable! The pattern paper we recommend is Pellon’s Easy Pattern 830 pattern paper. Pellon’s Easy Pattern 830 pattern paper is 45″ wide and comes in 10 yard bolts, which I’ve found to be just the right amount for my current projects and have handy for additional projects. I use Easy Pattern 830 for every pattern I make, as well as for making craft patterns, and doing alterations on clothing items. I have some patterns that were made over 15 years ago, and I can bring them out, press the pattern paper pieces, and they’re ready for me to use again. Where Do I Find Pattern Paper??? Add big income to your sewing business…… sew for plus size and full figure women. Many of you may already be doing some sewing for plus size women, but perhaps for many, you need to get the word out that you can and will sew for the full figure women. If you would like to take the sewing an additional step, and learn to make patterns for those hard to fit plus size women, you could get a corner on the market. 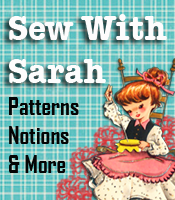 At SewWithSarah.com, we have classes and sewing patterns designed just for the full figure and plus size women. We have Pattern Making Classes, Pattern Changing Classes, as well as Sewing Patterns for full figure and plus size women. I would recommend that you begin with one of the easier classes, such as the skirt pattern making class or the slacks pattern making class. These are downloadable, and inexpensive, classes, so you could get started immediately. Go through the instructions and make a pattern following the measurements in the classes, then you’re ready to go to work on your first customer. The sewing pattern category has a variety of styles of patterns ready for you to download and make for yourself or your customer. We are adding new pattrens regularly, so keep an eye on this category. Choose someone who is one that you know pretty well, and let her know that you’re just getting started in the pattern making field, and want to make a skirt (or slacks) for her using her particular measurements. Once you’ve made a pattern or two, you’ll get the hang of it and feel more comfortable in marketing your new skill. When you make a pattern according to an individual’s personal measurements, I would recommend that when you’ve finished with the garment, put the pattern, along with the person’s name and list of measurements into a manilla envelope to keep for future use. On the outside of the envelope, put the persons last name, first name and date. By marking the envelopes in this manner, you can file the envelopes in alphabetical order once you start to accumulate new customers — then when you need to get out one of the patterns for another garment, it will be very easy to find. Making individual and personalized patterns for your full figure and plus size customers is something that will help grow your business as these women spread the word about what you can and have done for them. Be prepared for many new customers as word gets out about your pattern making abilities as well as the great selection of perfectly sized sewing patterns just for the full figure and plus size women! Does A Holiday Affect Your Sewing Business?